No one can remember a time when one person/company had 2 raffle tickets remaining with only 4 chances left in the drum. But that's one of the realities from the Wilkes-Yadkin Home Builders Association annual drawdown Thursday at Wilkesboro Civic Center. Dale Younger/A & J Rental survived 196 pulls from the tumbler...2 of the last 4 numbers belonged to A & J Rental...but still agreed to split the $8,000.00 total cash prize. On top of that, A & J Rental donated $500 of its $4,000.00 share to the current HBA 'house-build' project for Wilkes County veteran Chance Cleary. "There's no need to be greedy", said Younger, noting that one of the other surviving numbers belonged to the Brushy Mountain Ruritan Club, itself a local non-profit community service organization. The 4th remaining number was purchased at auction for $650.00 among a trio of legendary locals -- Glen Andrews, Cecil Wood, and Jerry Cowan. Cleary, 25, was on hand for the event...and led the group in the Pledge of Allegiance at the start of the festivities. Larry Thompson won $100 for being the first ticket disqualified at the start. Young Chance Mastin proudly took home $200, Dwight Phillips Jr. raked in $300, and Bill Lyons was awarded $400 in pulls at pre-selected intervals. A tremendous round of applause to A & J Rental, Brushy Mountain Smokehouse, Auctioneer Randall Woodruff of Great State Auction Company, Wes and Ann Tuttle, Sharron Huffman...and special thanks to anyone and everyone who bought one (or more) tickets and who sold one (or more) tickets. Our next HBA event: 28th annual Golf Tournament at Oakwoods Country Club, lunch provided by Wilkes Communications, Beverage Cart sponsored by Carolina West Wireless, and Tool Sponsor Modern Chevrolet. Friday, April 7th...1 o'clock shotgun start. 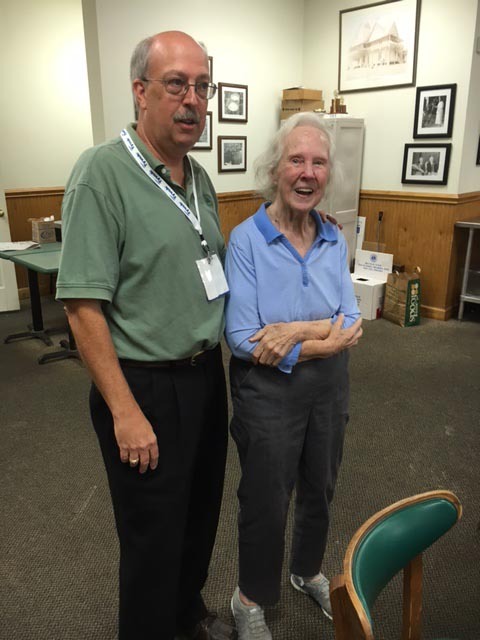 While the Association was eager and happy Thursday evening to host our annual "Legislative Night", or "Candidate's Night" as it's sometimes called; the unexpected, absolute highlight of the event was catching strong, long-time member, Pauline McLean out getting a dish of ice cream at the Brushy Mountain Smokehouse. Pauline retired a couple of years or so ago from Lowe's Home Improvement...with the distinction of having worked for the company longer than anyone else...some 45 years. As to the candidates: We got to hear from both ladies wanting to become the next Wilkes Register of Deeds. Democrat Connie Cox and Republican Misty Smithey courted the HBA with their plans to implement a process of getting important documents available 'on-line'...like 96 or more of the other counties in North Carolina have accomplished years ago. Incumbent Republican county commissioner Keith Elmore reviewed recent accomplishments, including a two-cent drop in the property tax rate. Vera Smith Reynolds, from Mount Airy, reported her extensive 32-year career in education, and the hardships of being married to a Vietnam era veteran that suffered with post traumatic stress disorder (ptsd). She's running as a Democrat in the 90th House District, which includes 3 precincts in eastern Wilkes County. The 94th House District is contested among Democrat Michael Lentz, a former director of Wilkes United Way...and Republican incumbent Jeffrey Elmore of North Wilkesboro. And rounding out the discussions...competitors for the State Senate's 30th District are Democrat Michael Holleman and Republican incumbent Shirley Randleman. Michael said he hopes to bring "sensible representation" to Raleigh, while Shirley hopes to increase collaboration among our neighboring and regional counties, and improve rural education. The election is Tuesday, November 8, 2016. Please vote! In other matters, the proposed 2017 slate of HBA officers and directors was approved. Eric Huffman (Huffman Bros. Const.) becomes president of the HBA upon installation in December. Highlights of the new board include the addition of Mark Lawrence, with Yadtel...and Gary Hayes, the Yadkin County Building Inspector, who lives in Wilkes. Ken Canter (Canter Construction) will conclude consecutive terms as local president. "Associates" night, or "TableTop" is tentatively set for Thursday, October 20th. Details, including the location, to be announced soon. The Tyson Foods processing plant in Wilkesboro runs through some 4-5 million gallons of water each day...about 8 gallons per processed bird. It's easily the most cost-effective and most-efficiently run of any of Tyson's plants in the country. Then there's water to be supplied to residents of the Town of Wilkesboro, several outlying Water Associations, and, at times, even the Town of North Wilkesboro, should the Reddies River go through severe drought conditions. Ken Noland, Wilkesboro's 17-year veteran town manager, reports long-running efforts at creating a consistent, long-term plan at keeping high-quality water from the Kerr Lake reservoir flowing for us...and the City of Winston-Salem. Ken's comments came during our June membership meeting. 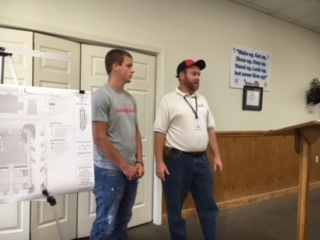 Also on hand...the 2016 Joe Faw Scholarship recipient...young Dylan Bauguess, of Traphill, now a North Wilkes High School graduate (left in picture) ready to start this fall in the Building Construction program at Wilkes Community College. Dylan joined the college's SkillsUSA team's National competition recently in Louisville, Kentucky. The HBA has also made a contribution to that program headed up by Team Advisor Hardin Kennedy. Those teams have traditionally performed very well... earning top honors over the years. GOOD LUCK to ALL!!! 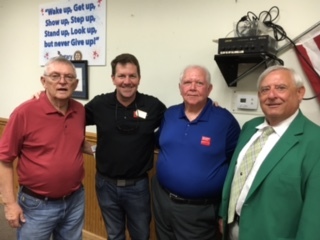 Wilkes-Yadkin HBA local president Ken Canter, State president Brian Pace, Membership Chair Jerry Cowan, Reg VP Gary Witherspoon of Hickory. On top of that, the HBA was pleased to have State Home Builders president, Brian Pace, join us...along with Region 8 vice president, Gary Witherspoon, and State membership chair Jerry Cowan, of Builder's Mutual Insurance Corporation. Brian's emphasis during his term as NCHBA president is to raise awareness of the many advantages of being an HBA member...advocating he wants to "Know, Grow, and Go". Ronald Huffman collected $70...his share of the 50-50 drawing that benefits the Scholarship Fund. Eddie Pope of Boone now manages the area Superior Walls of North Carolina operations: (Dennis Matherly is retiring) David Byrd now runs the Terminix member company out of Elkin/Jonesville. (George Ligon has moved to their Boone location). Nick Slaton is the new residential project manager for Carolina Heritage Cabinetry. (Nick's wife is their newest sales person - Joe Hartzog is now in Arizona) ...and Jody Parks, Parks Masonry (Parksmasonry.com) reported rapid growth for his patent-pending basement water-proofing system. Nationally, the NAHB Members Advantage program has added FCA - Fiat Chrysler to its offerings...$500 discounts on the purchase/lease of a new Chrysler, Dodge, Jeep, Ram, or FIAT brand vehicle... available to not just members...but to member company employees and household family members. It was the thought of not winning anything...that led to 5 raffle ticket holders electing to split an $8,000.00 grand prize at this year's Raffle dinner hosted by the Wilkes-Yadkin Home Builders Association. After all, $1,600.00 is better than nothing. Kristi Eidson (tkt sold by Anthony Sebastian/G & B Energy), Jacob Church (tkt sold by Ronald Huffman/Huffman Bros. Const. ), Martin Cheek (tkt sold by Rick Whitley/Rick's Electrical Service), and Joey Dyer (tkt sold by Bobby Nichols/Best6 Image Signs) were the top money winners, along with a ticket purchased for $600 at auction and split between Jerry Cowan and Johnny Huffman. Sherry Deal picked up $100 for the dubious distinction of being the first number pulled out of the tumbling drum. B & R Service got $200, Rick and Sandy Whitley pocketed $300, and $400 to Andy Davis as payouts at selected intervals along the way. Rick Whitley and Bobby Nichols sold more than half the total tickets allotted for this event. Thanks too...for keeping the books and other helpful assistance to Ann Tuttle, Sandra Huffman, Shanna Bell, Vickie Huffman, to all ticket sellers and buyers, A & J Rental, the set-up and take-down crew, and to Auctioneer Randall Woodruff...for another delightful, fun evening. Great State Auction Company has at least two upcoming events of interest to our members and the public. Our event helps the HBA in its support of such programs as Habitat for Humanity, the ReStore, the Joe Faw Scholarship Fund, SkillsUSA, among others. © 2019 Wilkes & Yadkin Home Builders Association. All rights reserved.